Parking available for up to 175 vehicles. Kareem is the Arabic Word for Generous - A perfect reflection of Chef Rachids philosophy and cuisine. 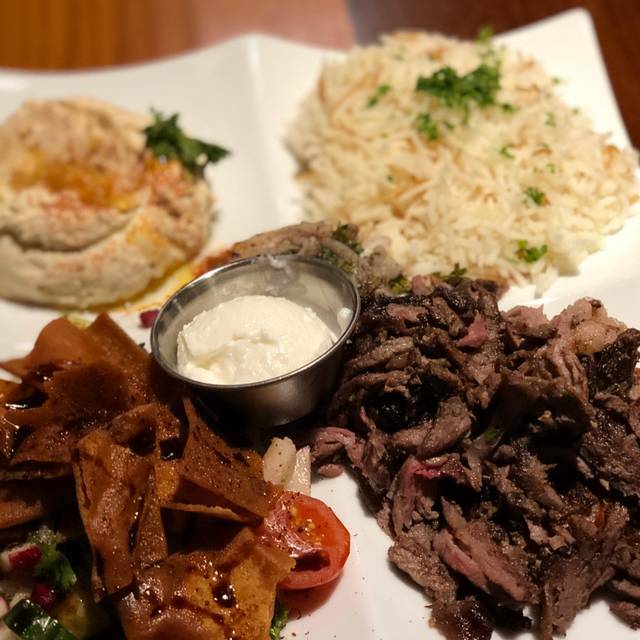 Enjoy the generosity of Kareem's Lebanese Kitchen through a plethora of delicious flavors. Experience the core value of hospitality, for which the Lebanese culture is well known. I think that place is so clean you could eat off the floor. Excellent service however my chicken kabob was very dry and did not taste like it was freshly made. BEST LEBANESE FOOD I HAVE HAD OUTSIDE OF LEBANON. CHEF RASHID DOES AN OUTSTANDING JOB. OUR SERVER WAS SOPHIA WHO KNOWS THE MENU AS SHE HAS BEEN THEIR SINCE THEY OPENED. SHE MADE GOOD RECOMMENDATI0NS AND EXCELLENT SERVICE. It was our 47th wedding anniversary. We were greeted professionally and courteously at the door. Our waiter was prompt and pleasant. The food was outstanding and then the chef sent out a dessert for us, on the house. Kareem’s is one of our favorite restaurants. We will definitely return. Our reserved table for 8 was ready and very comfortable. The food was INCREDIBLE. Service was WONDERFUL. Will return often and recommend to all friends and family. Wonderful flavors & spices with superb service! We’ll definitely be back. First of all , Chef Rachid is a charming, friendly gentleman...it was a pleasure to chat with him about cooking and his dishes. Our meze appetizers and the entrés were flavorful and delicious. We enjoyed our meal very much. Regarding the noise level - we sat outside where it was calm and almost quiet. I can’t comment on the inside noise level. Whenever we return to Naples we shall be sure to return to Kareem’s . It is always a treat to dine at Kareem’s. The classic hummus is outstanding along with the babaganoush and Chef Rachid’s eggplant salad. Our server spilled my wine and said she’d bring a napkin to clean but never did. My husband and my main came out before our friends by at least 10 minutes. And we weren’t given plates to share our dinner as asked. Also no serving utensils. Bread great as always but really spotty service. We LOVE the food...but the service on Sunday was not great. Entrees arrived 5 minutes after large appetizer platter, no refresh on rolls even after we asked, no sharing plates provided, just not up to par. But the food is sooo good we'll return anyway. We went to Kareems for the second time recently and it was every bit as good as the first time, when we celebrated a birthday. Every dish was delicious and the staff made the birthday meal special and all around awesome. The last time we went, we ordered an eggplant dish and the roasted chicken. Both were great but the chicken dish....wow. Best chicken I've had in 25 years. It was over the top terrific. The Chef moves around the dining room, in and out of the kitchen, showing how wonderfully connected he is to the food and the people who eat it. Bravo! We had a great night and meal at Kareems!!! The first thing we ordered was the iced tea, which is a mint based one- different and delicious. We then had the chef's sampler and tabbouleh as appetizers. 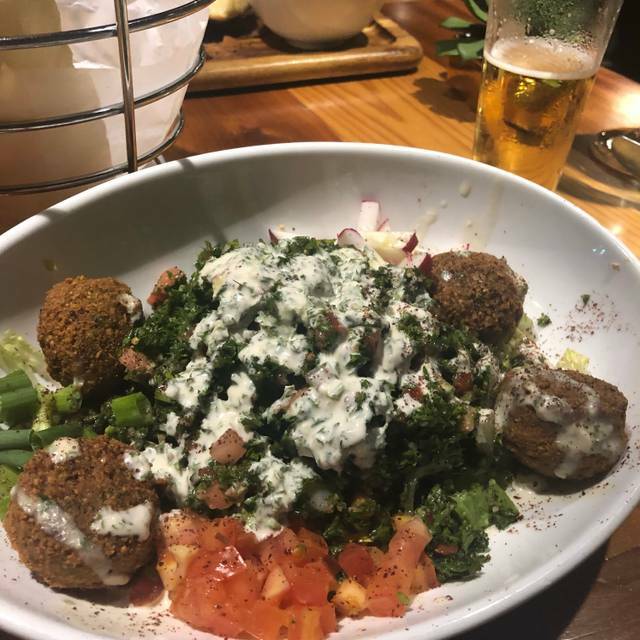 The tabbouleh was fresh and bright flavored- perfect lemony seasoning and a great balance to the sampler. 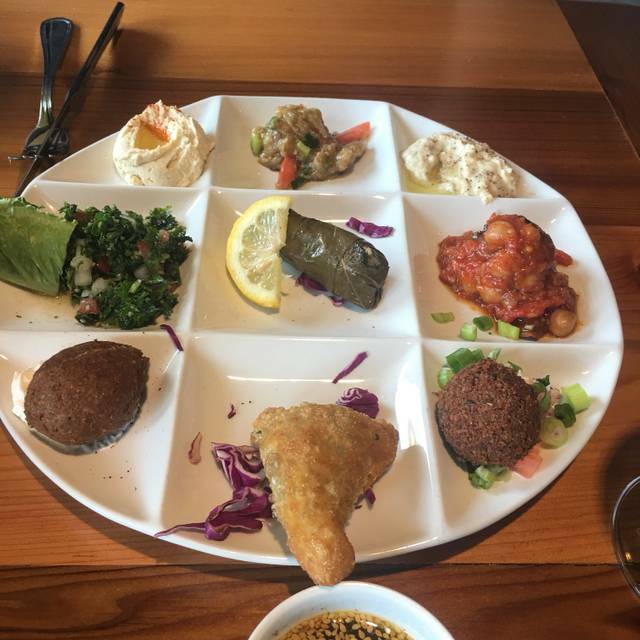 The sampler was a dozen little dips and bites that were all fantastic- perfectly seasoned and balanced, plus a great way to try many middle eastern tastes at once. For the main meal, we had the lamb shank special. 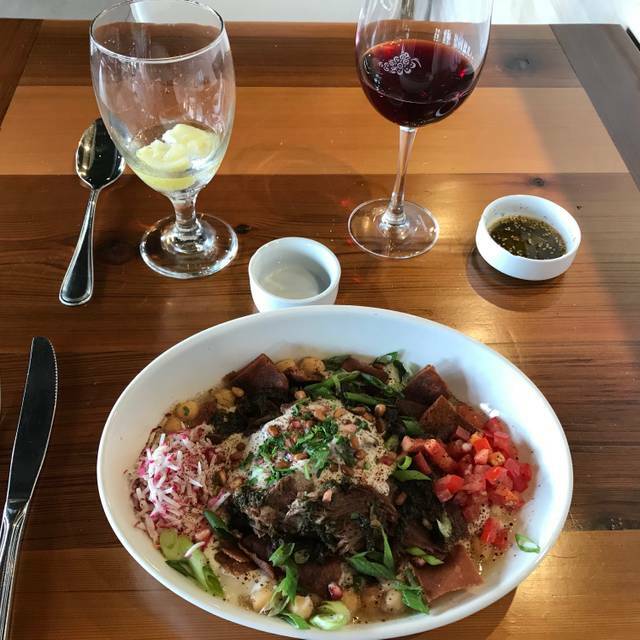 It was like middle eastern pot roast- slow cooked and tender, again with perfectly balanced spices. Dessert was the coconut cake with fresh blueberries. Moist cake with the pop of blueberries in every bite and generous whipped cream over the entire dish. It was a wonderful meal, and we are definitely going to go back sometime soon!!! The food was so flavorful and delicious! This is our new "go to" in Naples. Everything on the menu looked so good but we couldn't order all of it. We will be going back to order the rest of the menu. We got the large appetizer platter - it was so colorful with the variety of foods. 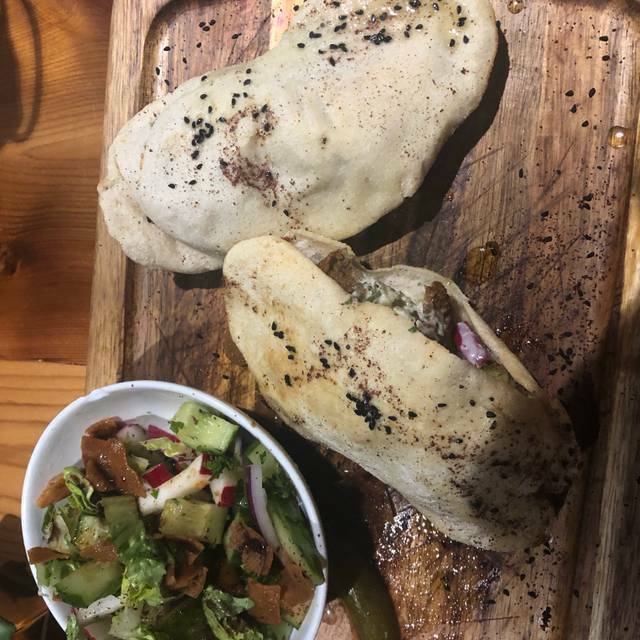 The fresh pita bread was hot, soft and crunchy at the same time. Everyone's entrees came out perfect. Dinner ended with the best baklava I've ever had. The baklava is made from scratch - not too sweet, filled with chopped pistachios between layers of phyllo. They advertise a lunch menu but upon arrival none was available. 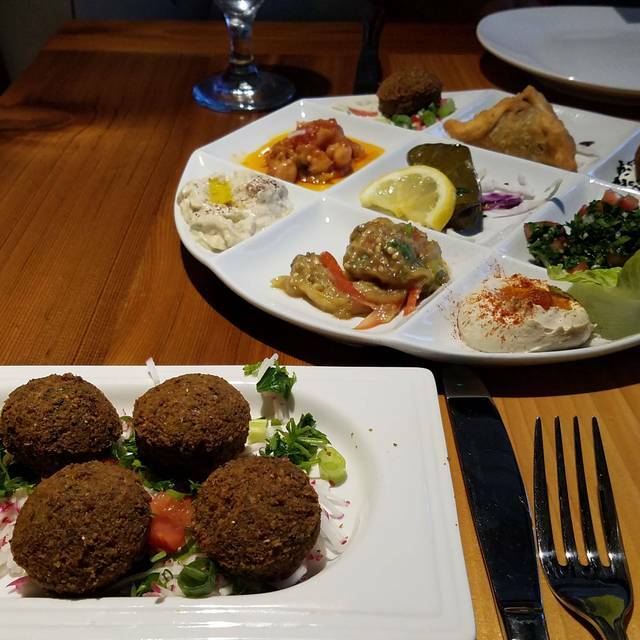 An excellent menu of Lebanese food from which to choose. Well-prepared and colorful dishes are nicely presented. This is the first time we have ever been to this restaurant and we were very pleased with the dinner. The food was delicious and the prices were very reasonable. We started with a couple of mezes, stuffed grape leaves and moussaka. For a main course I had the Chicken Farouj, which was excellent. My friend had the chicken kebabs and also liked it very much. 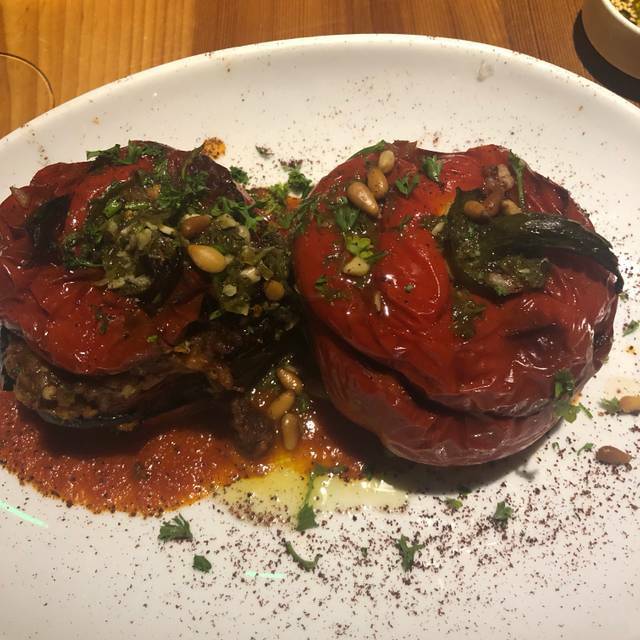 The men ordered Stuffed Vegetables and the Grilled Kofta. We look forward to coming back again. By the way, the Lebanese red wine was quite good. We made a mistake by not following the suggestion of our server. The baba ganoush was excellent as were the lamb shanks. The dish two of us got was a stewed lamb dish with rice. The lamb was overcooked and dry but the rice was tasty. Our server was pleasant but never came back to check on us . She also brought our check without offering dessert. Overall the restaurant was okay but I don’t think I would return. Food is outstanding but we sat need kitchen line and exhaust fan was not working so area was smokey with a variety of smells. Service and food was really good though. Delicious food. Very good service. Accomodating to our low carb diners and willingly provided lettuce leaves in lieu of the pita bread. it was our first time going to Kareems. the food was delicious and our wait staff was great. will definitely be back very soon..too many things on the menu that we need to try. Again, we were so happy with our overall experience at Kareem’s. Chef Rashid, personally greeted us and made two super special dishes, in addition to a full table of mezze. We brought a friend, who had never eaten Middle Eastern food. He is a local and is excited to bring more friends to try it. Edith’s service was attentive and proactive. She was especially good, and we look forward to working with her again! Thank you for yet another beautiful experience, Chef Rashid! Because of food allergy I expected they could grill and piece of chicken or salmon.....was told could not be done. I had some humus and wine....will not recommend or return. I am never disappointed when I go there. The food and service is excellent. Can't wait to go back. outstanding authentic lebanese cuisine at a reasonable price and in a lovely setting. The appetizers are all superb and we enjoyed the wine. Fresh hot bread is brought before the order is taken, but by the time the food arrived the bread was cold. When we asked for fresh hot bread, the old bread was removed and the replacement only arrived after we had virtually finished. The food is terrific but someone has to oversee the service. Great food in popular, noisy restaurant. A few errors occurred with order, but server was apologetic and accommodating in righting errors. Something different. I was not familiar with Lebonese food. Nice change. Very nice decor and excellent service. Delicious food. Good portion. Quiet at lunch. This is the place to go if you want authentic Middle Eastern food. Kareem is from Beirut and brought his Lebanese recipes with him. Everything is prepared from scratch and is delicious. We especially enjoy the lamb dishes. 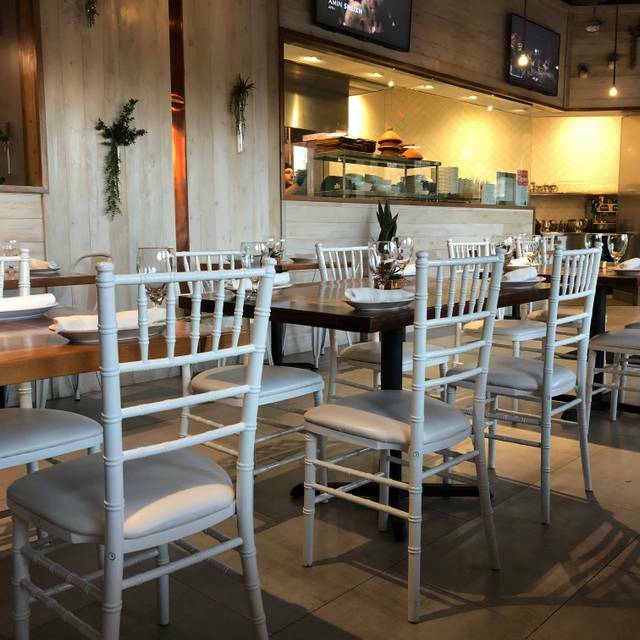 The dining room is attractive, and the wait staff is well trained and attentive. You'll enjoy eating at this restaurant. Great food. Totally recommend the garlic hummus! After seated , it was 10 min before our server asked what we would like to drink. I had unsweetened ice tea and asked for a sweetener pack. She never came back to bring it. Had to get up 15 min later to get it. App finally arrived, then our dinners. dinners. We were never approached again to ask if we wanted another drink or if our food was satisfactory. I had ordered regular pilaf and I was specific when ordering, I got the red pilaf. The food is always good here but the service is terrible. Food was fantastic with good sized portions. Had the sliced lamb loin. Highly recommended. Ask for Garlic paste for bread if your a garlic lover, you will be in heaven. Excellent food. Outstanding service. Well managed. Food was outstanding!! Service was outstanding! The Anniversary special dessert buffet was filled with homemade pastries and other desserts. Incredible dinner!!! 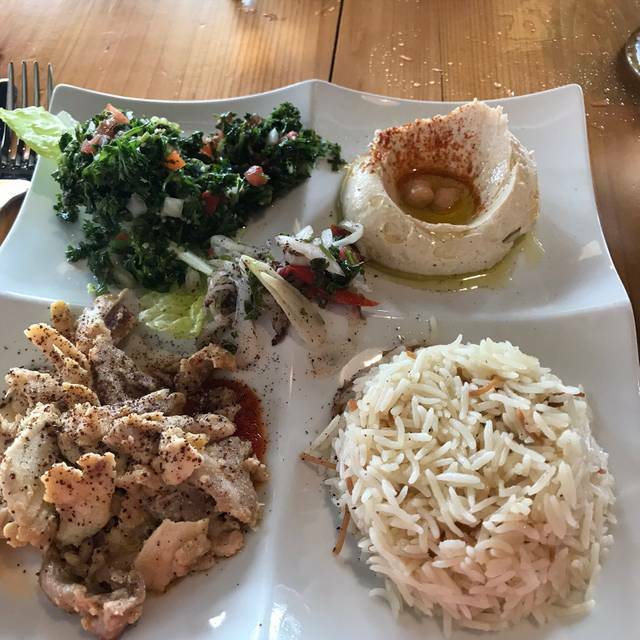 Wonderful Lebanese food! Fantastic flavors! You'll wish you were Lebanese! We had a reservation and I was happy we did. Restaurant was busy, seating inside and out. We were seated promptly, service was very attentive and polite. Food was outstanding and so delicious. I cook Lebanese at home and have run a catering business. I will definitely go back as the meal was well presented, food was delicious and service was excellent.